What I get when I pay the entrance fee of the milonga? When I go to the supermarket, I buy groceries, take them home, and then do with them pretty much whatever I want. The same happens with any merchandise I purchase. If I decide to become a member of a Club, I only take home my membership card , and the pride of belonging to my beloved Club. The Club stays where it is, and I come to the Club for whatever activity (social, sports, etc.) it is for. If I do not follow these guidelines, I will first receive a call, and eventually will be expelled from the Club if I keep ignoring these warnings. When I come to the milonga, I first pay at the entrance. What am I getting for my money? A dance? A glass of wine? A snack? I may get all that, but I am also receiving something more important. All these are elements that the organizers of the milonga provide you with the intention of enhancing the experience of attending. The money I pay at the entrance is used to organize it: pay the rent, arrange the chairs and tables, clear and clean the dance floor; the lighting, the ventilation of the room, the DJ, the sound system, the personnel that takes care of everything, and for all the freebies organizers give you to make you and all the milongueros and milongueras feel more than welcome to the home of Tango. The milonga is where Tango lives, where Tango is kept alive. When you are at the milonga, whether a well known milonguero/a or a new good student, you are making possible that Tango lives. You bring Tango to life, in your body, in everything you do with your body, not by dancing only, but by everything you do. Once we start dancing, we realize that everything we do is dancing. Dancing feels so natural, It makes us feel so at home in our bodies that it makes sense to see all aspects of our life from the point of view of being at the milonga. The fee we pay at the entrance of the milonga is not the price of what we are getting for that money. The $10 does not make a milonga a profitable business. The true organizers of true milongas do it for passion of Tango, not as a business. With that $10 you just contribute to the necessary setup of the milonga. But in reality the milonga is pretty much made by you. Since it is you who actually makes the milonga, the milonga will be the way you are: the quality of the dance, the behavior, the outfits of the dancers, the ambiance, all these characteristic of the milonga are what you bring with you. Not liking the milonga you attend is comparable with living in a neighborhood that you do not like. Everyone at the milonga is essential. 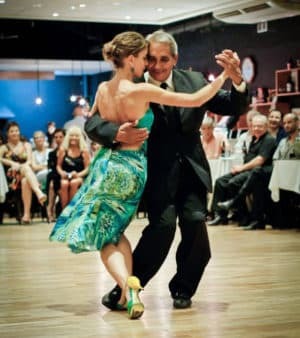 So everyone must be aware of having the responsibility of making the milonga a good place, even and especially, for having fun, as we are responsible for the world we live in, and particularly, for being happy. In that sense, the organizer of the milonga is not the one accountable for how a milonga is.